Kingsnakes (snakes of the genus Lampropeltis) are new world colubrid snakes inhabiting North and Central America, encompass a wide variety of sizes and color variations and are often referred to in literature as natures "living jewels" because of their sometimes strikingly beautiful coloration. Found in a variety of habitats, kingsnakes are often actively collected by hobbyists for study and captive breeding and in some regions their collection is a popular activity, though often regulated. Kingsnakes use constriction to kill their prey and tend to be opportunistic when it comes to their diet, including venomous snakes, lizards, rodents, birds and eggs, as well as siblings and littermates. The "king" in their name (as with the king cobra) references their taste for other snakes. In captivity kingsnakes normally take pre-killed rodents. 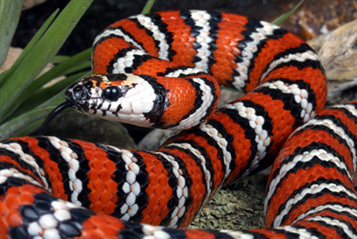 Most sub-species of kingsnakes are available today as captive bred specimens.